"I cannot sing from inside this iron vest!" After director Sergei Paradjanov released The Color of Pomegranates in 1969, the acclaim he received for it got him unwanted attention from the Russian government. Pomegranates already had several strikes against it: first, that it defied Soviet realism, and second, it had been filmed in a dialect that was illegal to make art in at the time. Over the years, Paradjanov would be unable to get any further projects off the ground. While some minor work for television was done, his major film ideas were either never begun or shut down by Soviet authorities. Eventually, Paradjanov was sentenced to five years in prison for a variety of non-existent crimes, among them, being a homosexual and supposedly trafficking in illegal art. The outrage at his imprisonment resulted in a massive attempt to get him released, including such faces as American author John Updike. Eventually, the attempt was successful, but only after Paradjanov had already served four of the five years. At the time of his release, Russia was a changing place and new attitudes began to emerge in the country. In 1985, Paradjanov was allowed to make a film for the first time since 1969. His subject was the legendary tale of Suram Fortress, a classic story of Georgian people attempting to protect themselves from invaders. 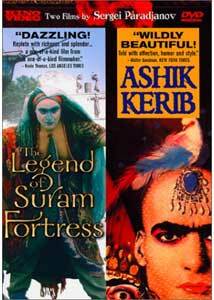 Soon afterwards, he again picked up his camera and made Ashik Kerib, a film translation of a legendary folk tale, in 1989. Paradjanov died in 1990, leaving these 2 films as his 'modern' legacy to accompany his 1950s and 1960s work. Both films are presented on this DVD, in a double feature. Suram Fortress is a metaphorical story that mixes Georgian legend with fact. The story, at its core, is about how a particular group of Georgian people continuously attempt to build a fortress in order to help them defend themselves. The general focus of this tale is that of a young warrior, Zurab. Zurab is the son of a man who was, at one point, a favorite of the local lord, but then betrayed and unable to return to retrieve his favorite love. Obviously, Zurab faces adversity from his fathe'rs former love, which leads to the conclusion of the film, in which Zurab must be the focal point of a prophecy to build the Suram Fortress. While Sergei Paradjanov is certainly in command of his craft, my impressions of Suram Fortress are really not as filled with praise as many people usually have for it. Suram Fortress is generally crafted well and certainly has that distinct edge of visual beauty we expect from Paradjanov; but at the same time it seems to spread the limits of the story very thin. While Paradjanov's abstract, surreal style was very appropriate for his Color of Pomegranates, using the same style here doesn't work as well because this is supposed to be a linear story. However, I found it a bit more confusing than entertaining, mainly because of the lack of explanation of what's going on. There are also many side-trips taken into the lives of other characters, which seemed to only thicken the confusion. Certainly, one might argue that the abstract beauty of Suram Fortress doesn't need to be understood, but I don't really agree. As a story of the Suram Fortress, the film doesn't really work and comes off perhaps a bit more pretentious then Paradjanov ever imagined. This is not to say Suram Fortress is a bad experience; it just feels a bit cold and distant, rather than a stylistic embellishment of an old folk-tale. This is made up for by the attention to detail though, as well as the religious symbolism that works itself into the story. This film is based on a classic story of a minstrel, Ashik Kerib, who is unable to marry the woman he loves. When his family approaches the father of the woman he wishes to marry, he scoffs at their poverty and refuses to give his blessing. So, Ashik decides to go wandering in order to make his fortune, so he can return and buy his love's freedom. Shortly after leaving home, his enemy tricks his village into thinking Ashik is dead, thus meaning that after 1,000 days of mourning, the villain will be able to marry Ashik's love instead, though she vows to resist such advances. Ashik wanders the land, not knowing what's going on at home, but instead, venturing to new places, singing his songs and trying to make money. Unlike some of Paradjanov's previous work, Ashik Kerib is not as abstract or stylized. Instead, it tells a wonderful story with a tremendous amount of warmth and heart. Paradjanov seemed to let go of a certain amount of his famous micro-control over the presentation and imagery, and the result is appropriately 'human' for a film filled with such innocence and splendor. Another element usually unseen in Paradjanov's work is humor, something abundantly present here, including some truly laughable sight-gags and exaggerated performances. It's almost as if Paradjanov is making fun of his own intense style. The film mixes lightheartedness with moments of sublime seriousness, all composed under a careful, artistic eye. The splendid visuals are accompanied by a moving soundtrack of ethnic arrangements and vocal sound collages. Ashik Kerib is truly one of the greatest films I have ever seen in this respect, as it tells a masterful tale with an amount of emotion and tenderness rarely seen in movies. My favorite example of this is the remarkable scene in which Ashik performs at a wedding for a blind couple and, out of sheer joy, the blind gravitate towards his lute. It is both 'high art' and very mortal and down-to-earth at the same time. It is also one of the greatest tributes to filmmaking put on screen. Paradjanov dedicated the film to his friend, director Andrei Tarkovsky, which is interesting because their lives shared many similar aspects. Most profound, however, is the similar way in which both men left this mortal coil. Tarkovsky almost predicted his own death with his solemn final film The Sacrifice, which mirrored aspects of his career. Similarly, Paradjanov's final film, Ashik Kerib, is a lovely final testament to a director's love for life and film, and he could not have planned such a graceful, beautiful exit. Although he had projects on the horizon, upon learning of Tarkovsky's death, Paradjanov stated that he would simply like to die and leave something like Ashik Kerib as a legacy. That is exactly what has happened. The work is easily his most accessible, and certainly his most touching. Image Transfer Review: Despite some damage, both films look very good here. Suram Fortress has very nice colors and there are no compression problems or digital artifacts. As with Kino's release of The Color of Pomegranates, the visuals can't really be compared with your average DVD, given the relatively low-tech methods with which the films were made and released. Be assured, however, it is presentation quality. The only noticable flaws are early on in Ashik Kerib, where there is an enormous amount of jitter and the film moves around a lot; this stops after a few minutes though. During the sequence where Ashik plays for a wedding of deaf people, I also noticed a tape-like crease over the middle of the screen for about 20 seconds. After evaluating it, this was definitely in the film (and not some player hiccup), and hardly worth mentioning. Audio Transfer Review: The audio in both films is fine. A few minor dropouts and distortion are there, but overall there's nothing to complain about. Ashik Kerib has a slightly more advanced soundtrack (including the use of keyboards on the soundtrack), and it's rendered very well and with good balance between everything. The only annoyance is that Ashik Kerib was dubbed into TWO dialects at the same time. So, whenever a character speaks, another voice talks over that voice in another dialect. Unfortunately, this was unavoidable it would seem. Extras Review: There are no extra features on the disc, other than menus. The subtitles are hard subtitled (actually part of the image). Both films presented here are important works of a visionary man. Although I thought Suram Fortress was a bit flawed, Ashik Kerib is certainly one of the most beautiful movies I've ever witnessed. Do yourself and favor and witness these works for yourself, either on rental or purchase.